By prioritizing sustainable transport solutions, Beijing can shift away from car culture and improve quality of life for its rapidly growing population. Photo by Philip/Flickr. Each year, 440,000 people move to Beijing in search of economic opportunity and better lives. Their rural to urban migration is a driver of economic growth, part of a larger plan to catalyze economic development through urbanization across China. However, critics have raised concerns over whether megacities like Beijing can achieve such growth while also creating a livable, sustainable urban environment. According to China’s Ministry of Environmental Protection, Beijing’s notorious air pollution ranks the third worst out of 113 major Chinese cities. City residents’ aspirations to car ownership and the sustained usage of the 5.3 million vehicles within the city are only exacerbating this air pollution challenge. The urban transport sector alone accounts for 31% of Beijing’s PM2.5 particulate matter – the main culprit behind respiratory health issues stemming from poor air quality. Setting the foundation for economic growth in Beijing will mean not only encouraging urban population growth – including the 2 million additional residents expected by 2020 – but more importantly improving quality of life for all residents. In the quest to address urban transport’s contributions to air pollution and greenhouse gas (GHG) emissions in Beijing, the Beijing Municipal Commission of Transport (BMCT) organized the Workshop on Sustainable Development of Transportation at the Background of Air Pollution Control on July 16, 2014. The workshop was supported by the Beijing Transport Energy & Environment Center, Beijing Jiaotong University, and EMBARQ China, and sponsored by FedEx. It served as a platform for exchanging strategies for creating healthy, sustainable, and prosperous cities. So, what can Beijing learn from the world’s cities? Cities thrive because of the competitive advantages they have in attracting talent and investment. Urban transport can either advance or impede these advantages based on where city leaders direct investment in mobility systems. Car-centric development, on one hand, creates expanded highway networks and urban sprawl, distancing residents from jobs and opportunities. Contrast that with people-oriented design, which features vibrant, safe, and complete streets and has more power to support businesses and attract innovators, contributing to thriving cities. 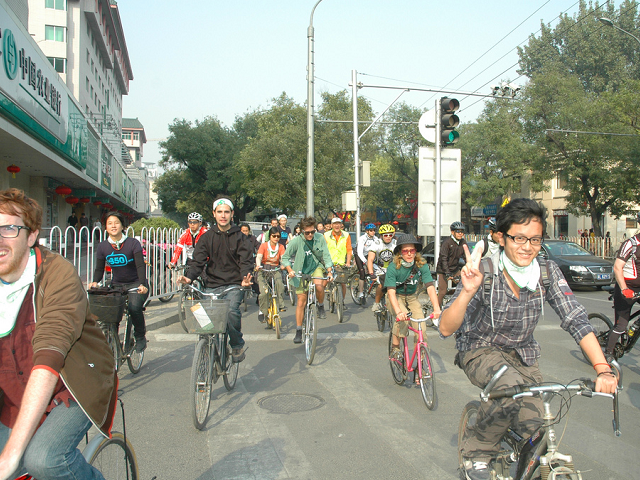 In Chinese cities, the car-centric model has been far more common. During the workshop, many participants admitted that their work revolved around widening roads, optimizing intersections, and building highways so that cars can move quickly. But these measures take a great toll on city residents for their contributions to air pollution and traffic crashes. Indeed, a growing number of cities are expanding solutions to meet mobility needs, turning to strategies like pedestrianization, shared mobility, and transit-oriented development (TOD). While many Chinese city leaders have rejected similar ideas for fear that they will increase gridlock, such measures can actually reduce traffic congestion while yielding environmental benefits. For example, New York City recently reinvented Times Square as a space for pedestrians, which has improved traffic flows and revitalized local businesses. In Portland, the city removed a section of highway and reclaimed valuable space for real estate development along the city’s waterfront. Active transport – like bicycling and walking – provides numerous benefits for the health and sustainability of cities, but creating an environment that supports safe bicycling and walking can be a challenge. Participants at the workshop highlighted transparent and inclusive public communication as key to building this culture. In the past, Chinese cities have taken a top-down approach to policy-making, without engaging citizens in dialogue about why sustainable mobility options can benefit them. For example, vehicle registration quota policies have slowed car ownership growth, but done nothing to combat the cultural preference for car ownership, with a long waitlist and even a black market developing around Beijing’s license plate lottery system. Cities that have emphasized public engagement in the planning process have seen greater results. Vancouver launched campaigns to increase walking and cycling as far back as 2008, easing drivers’ concerns by emphasizing that the goal was not to eliminate driving, but provide a wider variety of mobility options. Similarly, New York City has emphasized the traffic safety benefits of its pedestrianization projects for pedestrians, cyclists, and drivers alike. Beijing, like many other Chinese cities, had to come a long way before realizing that motorization cannot occur at the expense of quality of life. The Chinese folk tale “The old fool who moved the mountain” tells the story of how an old man moved a mountain to build a road, afterward celebrating his conquest of nature. In order to meet modern day mobility needs for the millions of urban residents in China, planners and city leaders must not think this way. Instead, they must adopt urban design approaches that place people and quality of life at the center of urban development. The Workshop on Sustainable Development of Transportation at the Background of Air Pollution Control received gracious sponsorship from FedEx. EMBARQ – the producer of TheCityFix – and FedEx have been working together for four years with the common goal to improve the quality of life for people in Brazil, India, and Mexico. This article has also been published in Chinese on the WRI China website.